Put all ingredients in a saucepan. Use an immersion blender to “put the stick to it” until desired consistency is achieved. Cook until bubbly and thick, at least 2 minutes to be sure to cook the flour. Stir constantly. Garnish with fresh oregano leaves. * When I can get 11 large, beautifully deep red bell peppers at my local mega mart grocery store for $10, I core and slice them. Arrange on 2 or 3 baking sheets. Douse with olive oil, sprinkle with salt and pepper. Roast at 400F for about 30 minutes or longer if you want them more “caramelized.” Cool. Store in air tight container in frig. 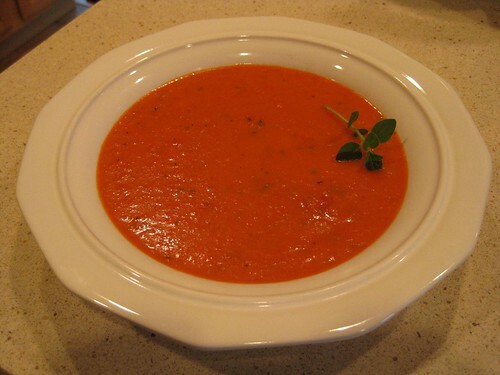 Great in this soup recipe, on sandwiches, in salads, in dips. Yum.